One anastomosis gastric bypass (OAGB) was suggested as an option in the management of weight loss failure after sleeve gastrectomy (SG). In parallel, the length of the biliopancreatic limb (BPL) is currently debated. To evaluate morbidity and efficiency of the conversion of SG to OAGB using two lengths of BPL (150 cm versus 200 cm). Retrospective analysis of a prospectively collected database on 72 patients operated on between 2007 and 2017: (200-cm BPL before 2014 versus 150-cm BPL since 2014). At revision, the mean body mass index (BMI) was 43.6 ± 7 kg/m2. Sixteen patients (20%) had type 2 diabetes (T2D) and 23 (29%) had obstructive sleep apnea (OSA). Early morbidity rate was 4.2% (n = 3). Mean BMI were 33.7 ± 6 and 34.8 ± 9 at 2 and 5 years, respectively. At 5 years, the rate of lost of follow-up was 34%. T2D and OSA improved in 80% (n = 12) and 70% (n = 16) of the patients, respectively. At revision, the mean BMI were 46 ± 8 kg/m2 and 41 ± 6 kg/m2 for patients with 200-cm BPL (n = 38) and 150-cm BPL (n = 34), respectively. Two years after conversion, the mean BMI were 34 ± 1 kg/m2 for 200-cm BPL and 32 ± 7 kg/m2 for 150-cm BPL. The rate of gastroesophageal reflux disease (GERD) and diarrhea was 13% and 5% in patients with 200-cm BPL versus 3% and 0% in patients with 150-cm BPL. This study shows that the conversion of SG to OAGB is feasible and safe allowing significant weight loss and improvement in comorbidities. Weight loss seems comparable between the 150-cm and 200-cm BPL. 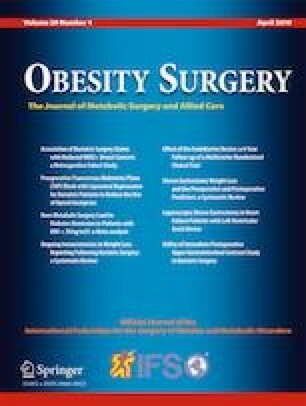 Cottam S, Cottam D, Cottam A. Sleeve gastrectomy weight loss and the preoperative and postoperative predictors: a systematic review. Obes Surg. 2019:1–9. https://doi.org/10.1007/s11695-018-03666-7.